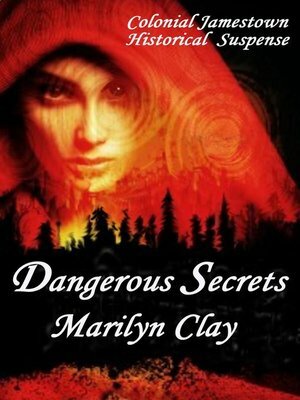 DANGEROUS SECRETS, A Colonial Jamestown Historical Suspense Novel by Marilyn Clay is set in the year 1620. "Master of historical detail, Marilyn Clay writes with intelligence and lyricism. In this page-turning tale of adventure and suspense, four young ladies set out for the New World on a Bride Ship from England in 1620. All four girls are looking for love, husbands and the adventure of a new life. "Reading DANGEROUS SECRETS is like stepping into history. Marilyn Clay has done an incredible amount of research into the period, how it would look and smell and feel if you were truly in 1620s Jamestown. The characters, and how they react, are just as authentic. The romances are sweet, touching and period appropriate. DANGEROUS SECRETS is the kind of book you want to get lost in. Thoroughly recommended." - Janis May, author. Look for DECEPTIONS: A Jamestown Novel, (also titled DANGEROUS DECEPTIONS) set in 1617 Jamestown: Catherine travels to the New World in search of her betrothed but finds that not all is as it seems in the New World colony and now wonders who she can trust? If you like historical suspense novels by Yangsze Choo, Libbie Hawker, Sally Gunning, Kathleen Koen and Kate Quinn, you'll enjoy Marilyn Clay's Colonial American novels, featuring life in Native American villages and colonial settler's huts. BETSY ROSS: ACCIDENTAL SPY, set in 1776 Philadelphia. Betsy Ross vows to uncover the killer responsible for her beloved husband John Ross' death but will she succeed before the ruthless, double spy kills her, or those she loves? Available in print and e-book. MARILYN CLAY also authored the new, critically acclaimed Regency-set Miss Juliette Abbott Mystery Series with clever, young Miss Juliette Abbott as the amateur sleuth. MURDER AT MORLAND MANOR, Book 1, MURDER IN MAYFAIR, Book 2, and MURDER IN MARGATE, Book 3, are now all available in print and Ebook. Book 4, MURDER AT MEDLEY PARK, will be out in 2018. All of the Juliette Abbott Regency Mysteries are clean, wholesome and suitable for young adult readers. STALKING A KILLER by Marilyn Clay is a contemporary murder mystery set near Dallas. Aspiring P. I. Amanda Mason sets out to clear her own father of a murder charge but can she catch the killer before he strikes again? In print and e-book formats.